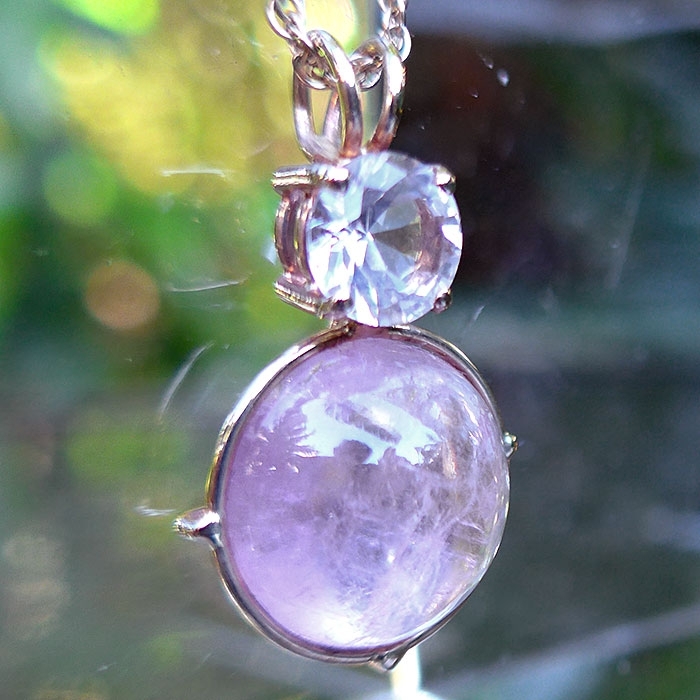 Dimensions (HxWxD): 1.1" x 0.65" x 0.35"
This 14 kt Gold Gemmy Pink Tourmaline Cabochon Pendant with Danburite Crown is sure to light up your heart chakra and give you a rosy and golden glow! The inclusions in the cab seem to give it a chatoyancy and make this stone extra luminous and along with the seriously sparkling Danburite, wow! 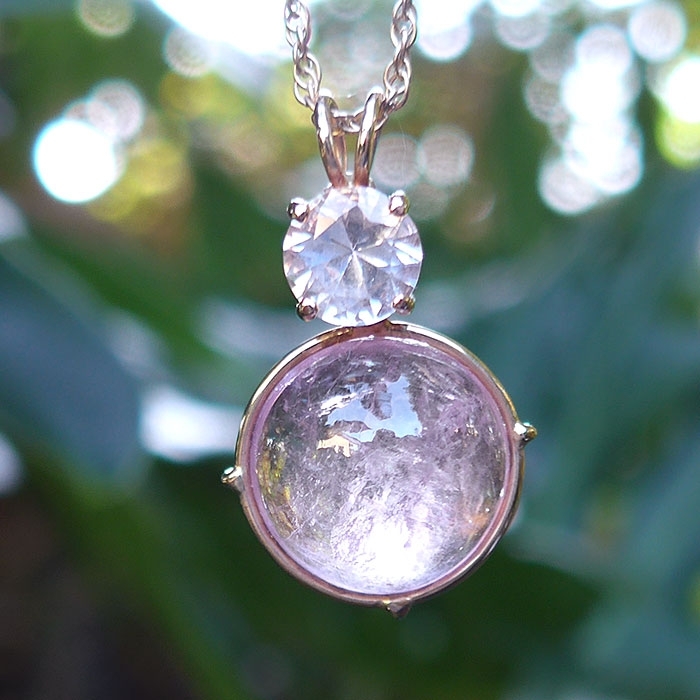 This Pink Tourmaline round pendant is set into 14 kt Gold with a simple setting which will allow the stone to breath. It also comes with a YGF chain and velvet pendant box. A sweet and sustaining energy signature! Crystal healers also find pink tourmaline to be extremely beneficial in treatment of individuals who have experienced the loss of a loved one, or who find themselves picking up on the emotional wounds of others around them. 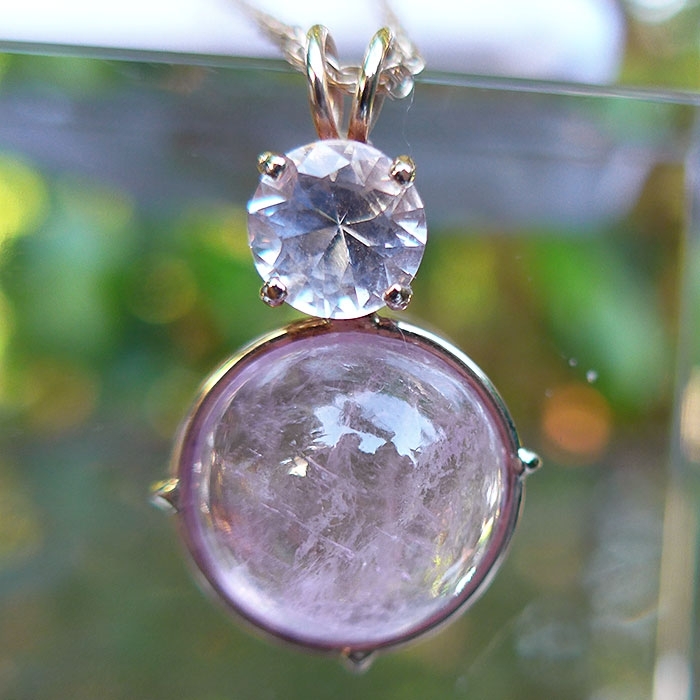 Pink tourmaline has often been used in the treatment of wounds to the emotional body, and especially a wounded heart, but because of pink tourmaline's elevated energy signature, this versatile gemstone can be used effectively in treatment of wounds to the heart, throat, third eye and crown chakra. Danburite energizes and activates the heart chakra, providing the energetic protection that gives us a feeling of emotional safety and personal power that facilitates the opening of the heart to others, loved ones, friends, family, and indeed the whole of humanity, and all of creation. This gemstone is a stone of compassion, and provides emotional healing that can mend the wounded heart. Danburite is also known for its ability to help you "let your light shine", connecting you with Higher Self and Higher Purpose, while enhancing your ability to co-operate with others in group activities beneficial to all involved. From personal experience during meditation with Danburite, I can tell you that much depends upon intent. When my intent has been to quiet the mind, holding one of these crystals reduces mental chatter to virtually nothing, while stimulating the crown chakra, the third eye & the eighth chakra above the crown, creating a feeling of warmth & depth, a buzzing and a tingling on the crown of the head and between the eyebrows. There was a physical awareness of a tremendous flows of energy carried on the inbreath and outbreath from the eighth chakra and higher, spiritual sources, through these vital centers and deep into the body. As you wear this pendant, make it your intention to align your own energies with the energies of the stone. The pendant will transmit energy & will work to attune your environment ever more closely to the higher vibrational frequencies of the spiritual world, benefiting you in whatever activities you are performing, whether you are doing meditation or energy healing or just having a normal day. You can also use this powerful crystal as a meditation tool to help you elevate & purify the energies in your meditation room, house or office & assist in aligning spirit with the Higher Mind and with the loving wisdom centered in the Heart Chakra & Higher Mind. This crystal has been cleaned with Universal Life Force Energy, and given an energy attunement using Reiki, a Japanese technique of energy healing, so it will continue to receive and transmit Universal Life Force Energy direct from the Source of Creation. It has also been cleaned and charged with the natural energy of sunlight. It is ready for you to program according to your own needs and desires. Note: Weight above is shipping weight. Actual Weight is 5.246 grams.